I think it’s important for there to be some farmers doing crop breeding. The development of agriculture as we know it for millennia was done by farmers and it’s really only in the last relatively short time that the farmers have completely, basically, taken a step back from that and it’s been taken over by researchers at universities and by private companies. Years ago I went to visit Raymond Loo at Springwillow Farm. I think I was doing an organic certification inspection. I remember seeing Raymond in a potato field behind the old farmhouse with another organic grower. It was very striking that some of the rows of potatoes were healthy and robust, and others were darkened and diseased. Right beside each other. Most people growing potatoes have fairly uniform plants. Raymond did not. He had different varieties growing side by side, and he was keen to dig them up and show them to me. I had assumed that if you have a pest or disease, it will hit the whole crop in roughly the same way. This was the first time I could really see a difference between a number of varieties’ ability to withstand blight. It gave me hope that some plants could be selected to withstand disease. I had no idea there was such a range in resistance. I also remember Raymond showing me his dad’s thornless raspberries and his huge nut trees. This was not the typical ultra-neat PEI farm. It was a place of discovery, with something new around every corner. I found it kind of magical. Raymond had an irrepressible joviality. He was into it. Obviously this farm family was going beyond just producing crops and livestock. They were not satisfied to passively buy seeds and accept the varieties available. They were seeking better varieties with useful traits for farmers. When the Island Sunshine potato was released for sale, a potato bred and selected by Raymond’s father Gerrit and his twin brother Evert, I bought them and planted them. I also planted Island Sunset, another Loo effort, when it was available. They were great varieties and we saved seed from them. Island Sunset in particular was interesting because it was so good at producing potatoes! I was harvesting them at the end of the summer, and I noticed a string of little bright red spuds were still forming. Even though it was the end of the season, the plants didn’t want to stop making potatoes! 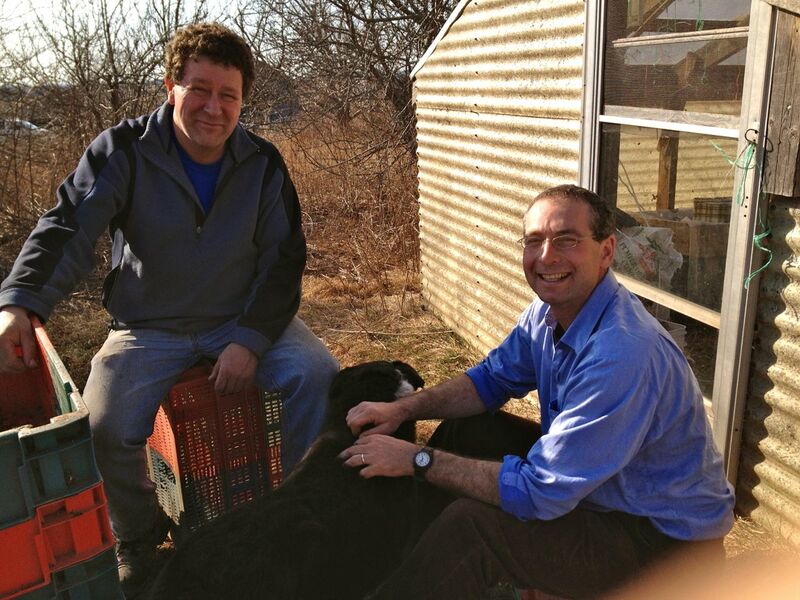 In April 2012 David and I went back to Springwillow Farm to visit Raymond. He agreed to take time out of his busy schedule to help us learn potato selection and breeding. We recorded the discussion and would like to share some of it in several blog posts. I wrote these posts 10 months ago, but I waited until now to publish them because I was so devastated by the news in September 2013 that Raymond had passed away. The next few posts are about the Loo family’s potato selections and disease resistance. Special thanks to Erica Fraser, Meg Harris, Jeana MacLeod, MJ Sakurai, and Emma at the Ecology Action Centre for transcribing the interviews! This entry was posted in farm mentors, potatoes, seed saving. Bookmark the permalink.